I'm pretty excited to announce that this month kicks off a new project I'm embarking on with my friend Lora from Savoring Italy. 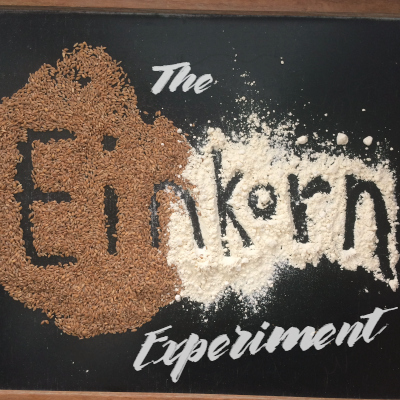 Together we'll be experimenting in the kitchen with the oldest wheat known to scientists*—Einkorn. We both have our reasons for wanting to learn more about this grain whose wild form has been traced back tens of thousands of years, mine being several. 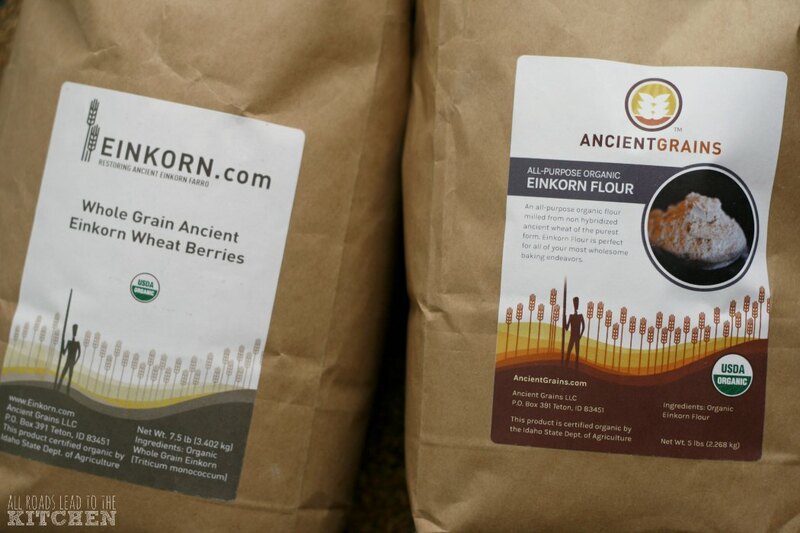 I'd read that einkorn was a nutritious grain that contained higher levels of protein and essential fatty acids, and that it was easier to digest than modern wheat. Since its nutrients are better absorbed, people wth gluten sensitivities are often able to consume einkorn without the belly and digestion issues (although it's not recommended for people with celiac disease or those who have allergies to wheat or gluten). Several years back, my mom cut most gluten from her diet (among other things) when her doctor suggested it. And though it pains me to say this, my system has started to change and have more sensitivities over the past couple of years as well. So, I figured now was the perfect time to introduce the whole family to this grain, and hopefully quell the rumblings on they sneak to the forefront. I am by no means saying that einkorn is safe or better for everyone, I'm just hoping to find out if it is better for the health of my loved ones. That's what I hope to learn from these kitchen experiments. I know there will also be a learning curve, because einkorn flour absorbs water differently than "regular" flour (the flour I'm used to working with). 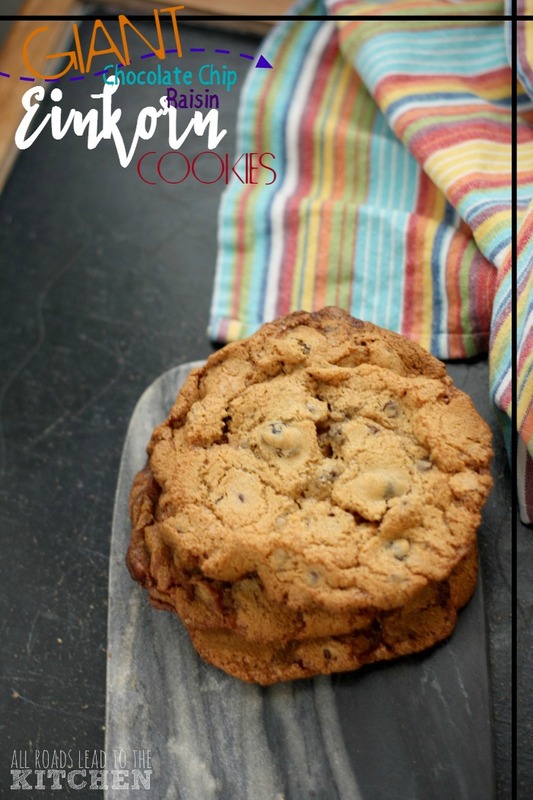 Those are my reasons, and I hope you'll drop by and check out Lora's introduction and Fig and Walnut Biscotti recipe today to find out her reasons for experimenting with einkorn. And a huge thanks to einkorn.com for supplying us with the einkorn we'll be using in our project! Since I don't yet know much about the "how" of using einkorn flour in recipes, I'll be using cookbooks and online sources as a guide and starting point—especially at the start. Hopefully I'll be able to create and substitute the einkorn flour when creating or adapting recipes by the time this year-long experiment concludes. The recipe I'm sharing today comes from one such source, The Einkorn Cookbook, which I found on Amazon. I used raisins instead of currants and brown sugar in stead of coconut sugar (because I didn't figure those would change the integrity of the recipe), but I kept the liquid and flour ratios the same. The book also called for creaming cold butter (which is basically impossible, because by the time you are able to cream it, it's warmed up - otherwise all you have are crumbles, not creaminess), so I've adapted that part of the recipe, as well. I hope you'll enjoy following along with Lora and myself in 2017. And if you have any nuggets of einkorn wisdom to offer, or want to share your favorite recipes using einkorn with us, please do! 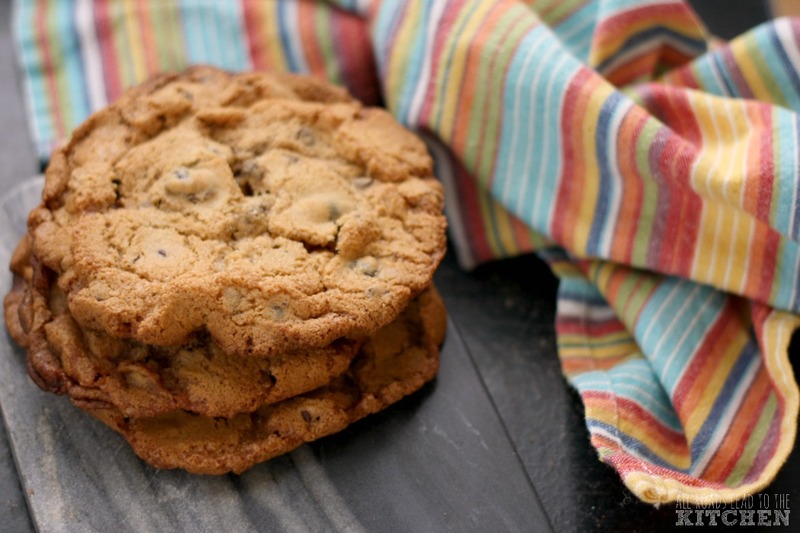 These giant bakery-style cookies are made with einkorn flour and studded with chocolate and raisins. Using a hand-mixer, cream butter and sugar together in a large bowl. Beat in milk, vanilla, and egg yolk until fluffy. Combine the dry ingredients and then add to the bowl and beat until just combined. Fold in the chocolate and raisins. Divide dough into 8 equal portions, roll into large balls, and place 4 evenly apart on each baking sheet. Be sure to leave enough space for cookies to spread. Slide into preheated oven and bake for 15-18 minutes, rotating the pans from top to bottom and front to back halfway through. Allow to cool on the baking sheet for a couple of minutes before transferring to a wire rack to finish cooling. ©All Roads Lead to the Kitchen. Adapted from The Einkorn Cookbook by Shanna and Tim Mallon.